I know of nothing grander, better exercise, better digestion, more positive proof of the past, the triumphant result of faith in human kind, than a well-contested American national election. We try often, though we fall back often. A brave delight, fit for freedom’s athletes, fills these arenas, and fully satisfies, out of the action in them irrespective of success. Whatever we do not attain, we at any rate attain the experiences of the fight, the hardening of the strong campaign, and throb with currents of attempt at least. Time is ample. Let the victors come after us. Sail forth! steer for the deep waters only! And we will risk the ship, ourselves and all. My enemy is dead, a man divine as myself is dead. All the things of the universe are perfect miracles, each as profound as any. 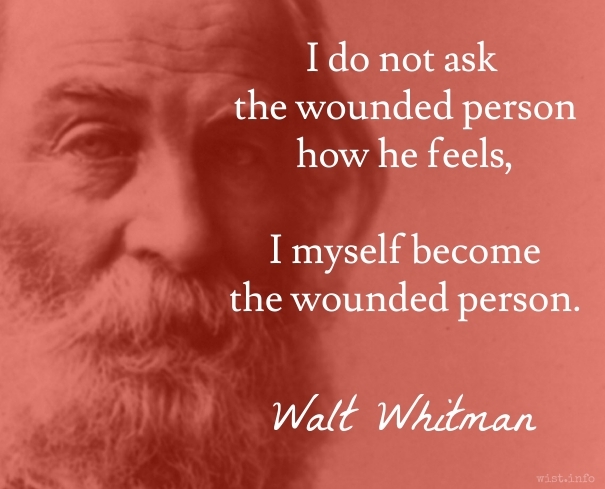 I do not ask the wounded person how he feels, I myself become the wounded person. Damn all expurgated books; the dirtiest book of all is the expurgated book. Paraphrase of a comment by Whitman to Horace Traubel, in Traubel's memoir With Walt Whitman in Camden (1906), entry dated 9 May 1999: "Damn the expurgated books! I say damn 'em! The dirtiest book in all the world is the expurgated book." This was in discussion about William Rossetti, who had published an bowdlerized version of Whitman's Leaves of Grass. See here for more discussion. Of all dangers to a nation, as things exist in our day, there can be no greater one than having certain portions of the people set off from the rest by a line drawn — they are not privileged as others, but degraded, humiliated, made of no account. This is what you shall do: Love the earth and sun and the animals, despise riches, give alms to every one that asks, stand up for the stupid and crazy, devote your income and labor to others, hate tyrants, argue not concerning God, have patience and indulgence toward the people, take off your hat to nothing known or unknown or to any man or number of men, go freely with powerful uneducated persons and with the young and with the mothers of families, read these leaves in the open air every season of every year of your life, re-examine all you have been told at school or church or in any book, dismiss whatever insults your own soul; and your very flesh shall be a great poem and have the richest fluency not only in its words but in the silent lines of its lips and face and between the lashes of your eyes and in every motion and joint of your body. What is life but an experiment? and mortality but an exercise? with reference to results beyond. If we’ve got the stuff in us, if we’re dead in earnest about it, it’ll find its own way of getting out. People who serve you without love get even behind your back. I like the scientific spirit — the holding off, the being sure but not too sure, the willingness to surrender ideas when the evidence is against them: this is ultimately fine — it always keeps the way beyond open. WIST is my personal collection of quotations, curated for thought, amusement, turn of phrase, historical significance, or sometimes just (often-unintentional) irony. Please feel free to browse and borrow. I've been adding topics/tags since 2014, so not all quotes have been given one. Full topic list. Only the 45 most quoted authors are shown above. Full author list. 9-Apr-19 - ***Dave Does the Blog on The Adventures of Tom Sawyer, ch. 2 (1876). 8-Apr-19 - Paraenesis votiva pro Pace Ecclesiae ad Theologos Augustanae Confessionis (1626) | WIST on Motto. 5-Apr-19 - Tomica on Journals IV.A.164 (1843). 13-Mar-19 - Defending Health Freedom: From Informed-Consent to Implied Consent – medicine-99.com on Letter to Henry L. Sprague (26 Jan 1900). 11-Mar-19 - L. Penelope :: Award-Winning Fantasy Author on Letter to Oskar Pollak (27 Jan 1904).